Like scouting itself, earning merit badges can be an adventure. But truth be told, some badges that are required for Eagle Scouts are considerably more fun to earn than others. Some can also be earned in a matter of days, while others take three months, minimum. And some are best done at Boy Scout camp, not at home. Here are insider tips on how to get those Eagle-required badges done in a timely fashion, without making the process too overwhelming for the Eagle hopeful or his or her parents. Earning merit badges takes time and effort. A Scout can navigate this process best when he or she makes a plan and minds important guidelines. Some overall strategies to keep in mind. Although civics, life skills, and wilderness survival comprise the knowledge base every Eagle should have, some of the Eagle-required merit badges are pretty dry affairs. Important, yes, but not necessarily thrilling. Encourage your Scout to do two or three per year—not all 12 at once— and to accomplish as many as possible at Scout camp. As for any merit badge, make sure your Scout signs up with a merit badge counselor and gets his or her "blue card"—the paperwork required for every merit badge—launched before any requirement work commences. Most troops will not give retroactive credit for merit badge work. Some troops hold badge-o-ramas or other day-long troop events where scouts can work on advancement projects and get one or two Eagle badges started. This is particularly helpful for badges that don't really fit the 7-day Scout camp format, such as Personal Management, Family Life, and some of the Citizenship badges. These tips will help you and your prospective Eagle Scout choose which badges to go for, as well as when and where. Only one of these badges is required, but many teens find the material so fascinating and exciting they end up completing both. Emergency Preparedness is a great badge to complete at Boy Scout camp. If your child is a lifeguard, he may find Lifesaving to be the no-brainer option. Either way, this is one of those badges that kids—and parents—love. Most people find that it's best to complete this at Scout Camp. The material is vastly more interesting in the wilderness, and the environmental observation exercises can be tedious if the only "wild animals" back home consist of ants and mosquitoes. Only one of these badges is required. If your child is a member of a swim team or goes to Scout Camp, swimming is the easiest, most straightforward choice. The hiking badge is a good option for non-swimming, nature-loving kids who enjoy serious, long-distance hikes. Don't even consider the cycling badge unless your child is a die-hard cyclist whose idea of fun is riding 20 to 30 miles every weekend. Like the Emergency Preparedness badge, this one is beloved by nearly every Scout. Its lessons are so central to everything in Scouting, chances are that most of the requirements will be finished over the years simply as a matter of course. Like every Scout merit badge, it's critical that your child gets signed up with a merit badge counselor before any requirement work commences, or it won't count. This badge is one of the more interesting, action-packed badges for teens. To earn it, a Scout must master every aspect of basic injury care, from the scratches and bruises of city life to potentially life-threatening gashes, breaks, and wounds that can happen in the outback. But while it can be exciting, it's not a good one for solo work. It's best done at Scout camp or as an organized troop activity. While the material involved in these three local, federal, and global civics badges is valuable, attempting to do all three at once is a recipe for disastrous levels of boredom. The better option is to get the community and/or nation badges started during a troop event or Scout camp and finish the work on one's own. The Citizenship in the World badge can be done entirely on one's own, with guidance from a badge counselor. Much of the work of this badge can be done individually with guidance from a badge counselor, but one component—the speech—requires an audience, which makes it a good option for a badge-o-rama event. All three of these "personal" badges are straightforward, important learning experiences that can be done entirely alone. Teens who are involved in high school athletics, in particular, will find personal fitness a breeze. Where it gets tricky is that each badge requires three months of activities and record-keeping to track all that exercise, budgeting, and/or household chores. Teens typically have no quibble with the tasks—it's the tracking that gets them, and failure to stay on top of the record-keeping means having to start over. Laying out a good tracking system—an Excel spreadsheet, for example—is critical. Once in record-keeping mode, your teen may find it easier to do all three badges at once. Boy Scouts of America. Merit Badges. 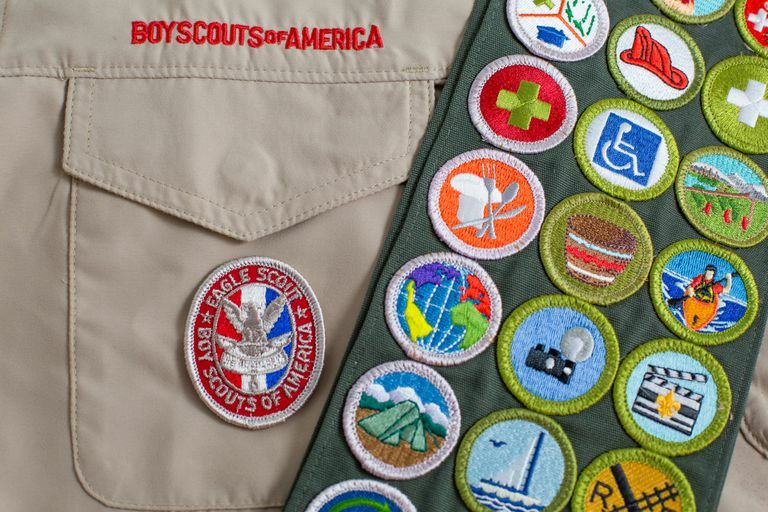 https://www.scouting.org/programs/boy-scouts/advancement-and-awards/merit-badges/.